Judy Yung: It is rare these days to find anyone still alive who can recall their detention experience at Angel Island. I first heard about Calvin Ong from docent Ben Lee and park interpreter Sam Lee, who had filmed Calvin’s return visit to the immigration barracks on April 12, 2018. Also known as Doan Ong, he had come through Angel Island as a ten-year-old son of a U.S. citizen in 1937, was detained for four months and deported. Undeterred, he returned in 1949, was detained at the Sansome Street building for six months, released on bond, and formally admitted into the country in 1951. 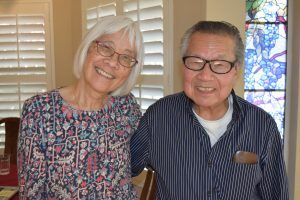 Now 91 years old and in excellent health, he sat down with me in his daughter’s home in Alameda, California, to tell his “sorrowful journey” to America. Calvin Ong, aka Doan Ong鄧超俊, was born in 1927 in Guangdong Province, Hoiping District, Wing On village. He was the oldest of two sons. His father, who had immigrated to the United States in 1921, ran a grocery store in Pittsburg, California. Doan attended the village school for a few years before his father summoned him to America at the tender age of ten. As a child, I didn’t know anything. I just listened to my father and agreed to come. I was just a package that they mailed from Hong Kong to San Francisco. Put a stamp on my forehead and “You go!” Actually, I love my mother and would really miss her. I learned later that she was so heartbroken after I left, she stayed in bed without eating or sleeping. Everyone in the village was talking about going to America. They called it Gam Saan, Gold Mountain, so I thought there must be a lot of gold over there. I should bring my own shovel and be ready. I think America is a rich country. Everything is modern, the best place in the world. I think it still is today. America is number one. Armed with a coaching book that he diligently studied and a suitcase full of Chinese herbs that his uncle had packed for him to take, little Doan Ong was sent alone to America. After his ship, President Coolidge, arrived in San Francisco, he was taken immediately to Angel Island for immigration inspection. He barely recalled the physical exam that he readily passed, but he remembered the exact location of his bunk bed and the exact same step in the staircase on which he sat every day. In the morning after breakfast when there was sunshine, I like to have a little suntan. So every morning I sit on the same third step for at least 15 or 20 minutes. I was the only one who sat on the steps. And if I had been able to speak English then, I probably would have sung, “You are my sunshine, my only sunshine,” as I did for Ben and Sam during my visit last April. We have to have something to do every day…so we have a phonograph player and Chinese opera records. Turn it on, everyone gathered around and listen to the records. Some people played games like poker or twenty-one. Not gambling, just for fun. And they had a basketball court in the back yard there. We played ball every day. I was the only kid there. They said, “Come on, son, shoot!” I knew how to play basketball from school in China. The living conditions there were alright. They gave you a nice place to sleep. They provide three meals a day. And then if you get sick, you talk to the number one man [the president of the Self-governing Organization]. Then the number one man contacts the agent, “We have someone sick here.” Then they made arrangements to send him to the hospital [at Angel Island]. I went there a couple of times because something was wrong with my throat. I cannot swallow and it hurts me when I eat. They gave me some kind of treatment but it didn’t work. So they decided to send me to St. Mary Hospital in San Francisco. Finally, they gave me minor surgery [for bronchitis]. Cut it open and remove something. After that, I was alright. The hospital at Angel Island was just a little dorm room with a couple of nurses. Altogether, less than ten [Chinese] persons in the same room. We did everything there, eat and sleep, not much doing. No communication because I didn’t speak English at that time. In fact, I really liked the hospital in San Francisco better. They were very nice to me. I remember one time, I like orange and feel like having the taste of orange. I motioned to the nurse [makes a circle with his hands]—that means orange to eat to me. She said, “What?” Of course, she did not understand me. Later on, they send an interpreter to the room. And the interpreter asked me [in Chinese], “What do you want?” I said, “I would like an orange.” And he told the nurse [in English], “He would like an orange.” After that, they send me an orange every day. That way, I know I have enough oranges to eat. Another time, a nurse dressed me in nice clothes and took me out to a busy street full of people, cars, and stores. I remember she bought me an ice cream cone. Wow, that was yummy! I will forever remember the wonderful time I had that day, thanks to the dear nurse. Bless her kind heart! Two or three weeks after his arrival at Angel Island, Doan was called before the Board of Special Inquiry for the interrogation. They take me downstairs. There is the secretary who typed up the script, a Chinese interpreter, an inspector who asked the questions, and myself. I was called two or three times, each time about an hour or so. I was not afraid of anything. In a way, it was a new and interesting experience to me. They asked me a question and I answered—that’s all. Maybe I said something I should not say, but I say it anyway. The coaching notes I had studied were not all true because some of contents was based on my father’s old testimony as a paper son. If it had been based on real things, I would remember right away. That’s why I was deported. When I heard about the decision, I didn’t like it, but I didn’t feel upset. I guess that’s the way it is. It depends on your luck and a lot of things. I just have to accept it. So I said to myself, from now on, if I want to do something, I should think it over and make some preparation, have a little planning before you act. So that’s one lesson I learn from Angel Island. 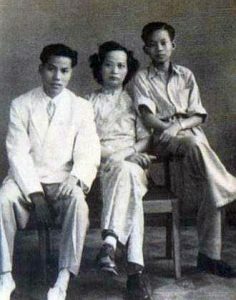 Upon his return home, Doan resumed his education in Hong Kong until the Japanese invaded China in 1937. He finished middle school in his village and high school in Canton. He was half-way through college when the Communists took over China. He wrote his father, “Dad, I’m in trouble now. I cannot stay here no more. 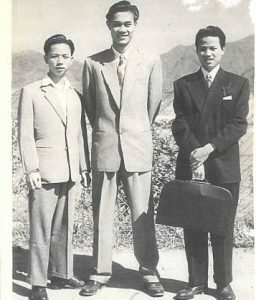 I want to come to America again.” With the help of immigration attorney Wing Ong (his uncle and the first Chinese American to be elected to Arizona’s House of Representatives, and any U.S. state legislature, in 1946), Doan came back to America in 1949. This time, he was detained at the immigration facility on Sansome Street for six months. All the Chinese were kept on the sixth or seventh floor. They had a different floor for the Mexicans. Those Mexicans are very smart and brave. They try to escape by using the bed sheets as rope and all the way from the six floor down to the ground floor. It’s a long way, but they got away. They open the window and one by one they climb down. Later on, I found out many people escaped that way, but not the Chinese. It was pretty crowded there. I remember a big hall full with men and three tiers of bunk beds in two columns. There was a women’s dorm downstairs. Also a mess hall one level lower, just downstairs. We went there for meals. No recreation yard. We did the same things…played records, played cards. We even made our own basketball game. They had plumbing pipes in the ceiling. Some had round holes that we used as baskets. We threw the ball and two points! We didn’t hurt anything so they didn’t care. The pipes were made of steel. You could not break them. It should be okay. There was a Gee Gee Wui [Self-governing Organization] too, and I was the treasurer. I was the one who kept the money. When newcomers arrive, we have a briefing about what is going on and ask them to pay a fee, a small amount…one time only. The money was used for repairs or new records for entertainment. Everything cost money so we have to have a little money around for all the uses. We were locked up like on Angel Island, but the building at Sansome Street was better. High rise building…first class. We had heat. Toilets and everything were more modern. My favorite memory there was looking out at the people free and hope I can be free like that. I could see Chinatown, Grant Avenue, and Jackson Street, all the neon lights, like heaven. Thanks to his smart attorney Wing Ong, Doan was released on bond while his immigration case was being investigated. 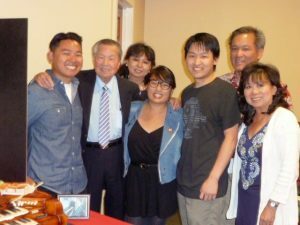 He went to live with his father in Oakland, attended English as a Second Language classes at Oakland Tech High School, and adopted an American name–Calvin Ong. He was drafted into the U.S. Army in 1951 and assigned to an intelligence platoon in the Korean warfront. A month later, the Immigration and Naturalization Service informed him he had been admitted into the country as the blood son of a U.S. citizen. I saw the war up front but we don’t have to fight. Our job is to get the information from the enemy and report back to the headquarters. I was in danger all the time. One time, ten minutes after we made a report, I heard the artillery buzzing and the smoke. The flames rise up just like barbecue pits. Lots of barbecue right there, okay? In our platoon, we have two Japanese from Hawaii promoted to be sergeant. He got a little power over a squad of about twenty soldiers. If he told you to do something, you’re supposed to do it. Some didn’t like that because he’s Asian, so they didn’t obey the order and made the sergeant mad. He said, “You want to get tough? I send you to the front line to fight instead of sitting right here and give me a bad time.” So they shut up. Something like this is discrimination…all the time. It’s the army, not civilian. You can’t get away with not obeying orders. An order is an order. I don’t care who you are. But some people don’t look at it that way. After he was honorably discharged in 1952, Calvin finished junior college on the G.I. Bill and following his father’s advice, started his own business. “I wanted to be my own boss,” he said. He bought a liquor store, two grocery stores, and later, a Chinese restaurant in Oakland Chinatown. He married Ellen Lee in 1955, had two daughters, Victoria and Laurina, and retired a wealthy man in 1989. Now a grandfather of three, he spends his time exercising, reading, and playing music on an electronic keyboard. In conclusion, he said, “One time my grandson asked me, ‘What is your best moment in life and your saddest moment in life?’ I already wrote the sad one, and I have it right here.” To see Calvin reading this, please visit our Youtube page. It was late afternoon and my time was up, deporting me back to China. The steamship started sailing slowly toward the sea. I went up to the top deck and stood near the hand rails of the ship in order to have a last look at the lovely city I liked. The hour of parting was kind of sad and disappointing. The ship kept moving at a moderate speed. The image of the harbor was getting smaller and smaller, and finally the beautiful scene just disappeared. Also, the splendid Golden Gate Bridge slowly faded away. I couldn’t do a thing as tears shed down from my eyes, not finding a shoulder to lean on when crying. Shame. Then, I just left my heart in San Francisco. After a moment, I felt very lonely and unhappy, just walking around and around, seeing nothing but water in all directions. The evening would be approaching soon and the sun was rolling down. The sea was so beautiful and gorgeous with the reflection of the sunset. Well, I should call it a day and return to my room immediately. Oh my, my. Poor me, poor Doan. Judy Yung is professor emerita at the University of California at Santa Cruz. Thanks to the Ong family for photographs and hospitality!